Taking the heat out of freshly harvested romaine and leaf lettuces is essential. One of the methods commonly used is hydro-cooling. For the most part it is a very effective method used in the leaf lettuce industry. Unfortunately one of the drawbacks sometimes results in watersoaked leaves. As you can see from the image above the leaves affected will show a watersoaked-translucent look. If you are going to encounter this problem the plants most affected are usually found at the bottom of the carton, where they have been sitting exposed to the cold water. Plants affected by transit freezing may have this same appearance, but they will be dry, and the location will indicate a pattern of freezing, most likely affecting the plants in the top layer or along one side of the carton. Plants affected with this watersoaked condition usually have only a few outer leaves affected. As with other condition defect these plants will also become worse, as the watersoaked areas will become darker in color and may break down into decay, as the affected plant tissues have been injured. Usually just by trimming a leaf here or there may take care of the problem when placed on the retail shelf, but sometimes the damage is too extensive. In order to score this as a defect, you would have to have more than 2 leaves materially affected by the watersoaked areas. As you can see, the plant on the right has at least three leaves materially affected by the watersoaked condition, without even peeling the outer leaves back. 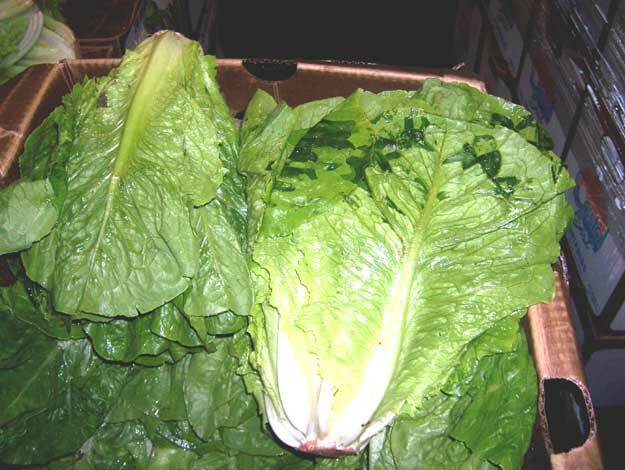 Overall, the U.S. Grade Standards for Romaine and Leaf Lettuce allow for 10% defects; therefore if you average 2 plants per carton (2 dozen) with the discoloration you would have 8%, while averaging 3 plants per carton you would have 12% discoloration, failing to grade U.S. No. 1.